Imagine this: You’re wrapping up an hour-long presentation you’ve been preparing for weeks. All of a sudden, you realize no one was taking notes during the meeting, and all the insights that were discussed over the last hour have been lost. Then, you remember something magical: The video conferencing room you’re presenting in is equipped with AI-based voice analytics. You can go back through the transcription, and even jump to a specific interaction that was midway through the meeting. The day is saved! It’s easy to see why 73% of users believe AI will have a positive impact on their physical and virtual meetings, according to a survey by Zoom. 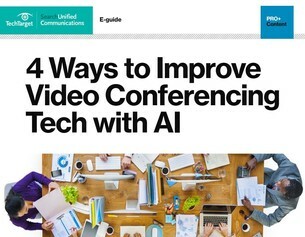 Take this survey to access our 4 Ways to Improve Video Conferencing Tech with AI guide, and explore other ways AI can big meetings a little less chaotic.